I hate flavored coffees and the reason is, in most cases they use crap coffee as the base and then try to 'doctor' it up with flavor. Don't even like Starbuck's flavored coffees, even though they are more tolerable. Starting a food review stating with "I need to have my coffee just the way I like it, or I get cranky" and then later on, "Flavored coffees aren't really my deal" is not the best way to go about making your point. You are telling the reader that you already have a bias against the product so your judgement will be clouded by your own disposition. If you want to be a better food critic try to show the reader you are tasting food with an open mind. This review is completely void. 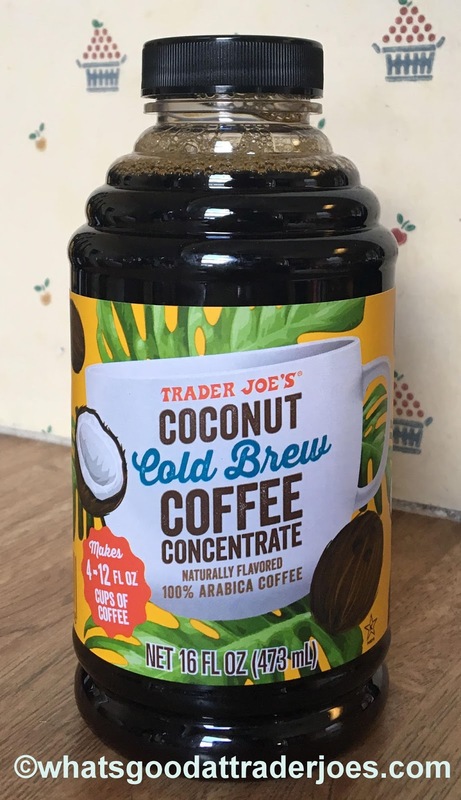 Also, I have tried this cold brew concentrate and it is incredible. Thanks for the advice on writing for my very successful blog that's been running for dang close to seven years now. OUR very successful blog, buddy :) But yeah, people seem to be a little too full of writing advice lately. My stance is that all flavored coffee is just Wrong so i won't be buying this one. I actually really don't like the regular unflavored cold brew concentrate from TJs- and i regularly make my own as well as buying from the few coffee shops that make a decent version. I love the coconut cold brew and so does my husband. Very upset that we can no longer find it. Probably because of some of your #*@# comments. TJ's says it is a seasonal item and will be back in Spring 2018 - crossing fingers. I just bought the last two Amazon had for $30.00! I like my coffee the way I like my coffee! PS: I mix it one past Coconut Cold Brew to three/four parts Califa Farms Mocha Cold Brew. I do the same with TJ's French Roast Cold Brew.